First before we get into the nitty gritty of the issue, I’ve got some housework to attend to. I’ve decided to change the title of the series to be a TOUCH less narcissistic, but the M.O. is going to stay the same. The article is going to focus on one comic each Tuesday that I think you should be reading. I’ll give you a spoiler free review of the issue along with a little set-up in case you’re unfamiliar with the series. (I’m going to try to be as spoiler free as possible, but there will certainly be some for older material. Be warned!). Finally, I’d like it if you would give me feedback on my writing or on any issues that you might have with the article (it’s the only way that I’ll improve! Thanks!) With that out of the way, we’re looking at The Ultimates # 5 this week. All Speech bubbles removed from images to prevent spoilers. 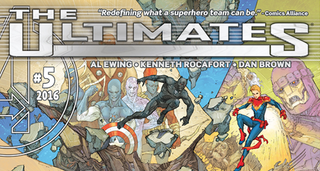 The Ultimates is a breath of fresh air in Marvel’s publishing line. It feels like something different, it looks gorgeous, and it is thought provoking. I think you should be reading it!